It's stressful enough when your kids have a holiday wish list that reads like an alphabet soup of pricey, high-tech gadgets that aren't within your budget to begin with. What's worse is breaking down and running up your credit card balance buying the Xbox, DS, or iYouNameIt at the last minute because you couldn't think of better gift alternatives in your price range. For those who are doing their Christmas shopping on a tight budget, here are some ideas for lower-cost presents guaranteed to wow the little (and not so little) ones this holiday. Watch how fast they put down the video games once this deliciously fun and surprisingly healthy (the treats are baked, not fried) doughnut maker is unwrapped. It's simple enough that younger kids can operate it with a little supervision, while the older elementary set can do it themselves. Breakfast in bed, anyone? Winner of multiple toy awards, Snap Circuits is the top-rated toy on all of Amazon, with 362 five-star ratings. The reason this toy is so beloved by parents and kids alike is that it's the perfect combination of educational and cool. The kit contains dozens of parts and instructions for fitting them together to make everything from a radio to a lie detector. After two years of pleading, I finally bent my no-weapons rule to allow these. What's more fun than shooting marshmallows at your siblings? Answer: The peace and quiet of having the kids outside for hours. The only problem is getting the adults to put them down. This one may be more for the parent than the child, but babies won't notice and parents of a certain age will be thrilled. Sadly, the Yoda design didn't exist when my kids were toddlers, but we owned more than a few pairs of Robeez and they wear (and wash!) like a dream. A gift that makes thank-you cards fun and painless? Bring it on. This kit contains blank cards, lots of punch-out shapes, and design suggestions for a whole range of greeting cards. Not only did my two kids spend hours with this, they have even asked for refills. This sweet, soft turtle projects a sprinkling of stars on the ceiling in a variety of colors. So simple, but reassuring for little ones who are anxious at bedtime. Both of my children got a Twilight Turtle as babies and both turtles still shine nightly. This kit is great for children who love to write and draw as much as my oldest does. Kids can write and illustrate their own story, then send it off to be transformed into an actual book. When my daughter asked to learn chess a few years ago, I groaned, having never mastered the game myself. This set, with its instruction cards and helpfully labeled game board (hints on one side, plain on the other once you're ready), was the answer. It's simple enough that we both quickly mastered the basics -- though I never got good enough to beat her. Sometimes the best gifts are the most obvious. A brand new box of crayons is a timeless thrill, and you can never have too many. Spring for the big box and throw in a thick pad of paper for a present than spans age, gender, and generations. Another classic that may not get the big oohs and aahs, but will have lasting appeal, is this childhood favorite that can be enjoyed by younger kids as well as tweens (and adults!). Wrap up the cards with an invitation to a family UNO tournament, and let the games begin! 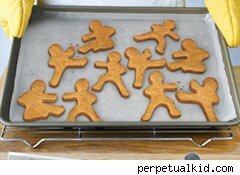 Ninjas are big this year, and these cute cookie-cutters appeal to ninja fans of any age. Package them up with some gingerbread mix and a tube of premade frosting, and you have a tasty gift for around a tenner. Check out another gallery, The Worst Gift I Ever Got on DailyFinance. Motley Fool contributor Robyn Gearey owns shares of Amazon.com and Apple. The Motley Fool owns shares of Best Buy, Wal-Mart, and Amazon.com. Motley Fool newsletter services have recommended buying shares of Amazon.com, Staples, and Wal-Mart, as well as writing covered calls on Best Buy and creating a diagonal call position on Wal-Mart.